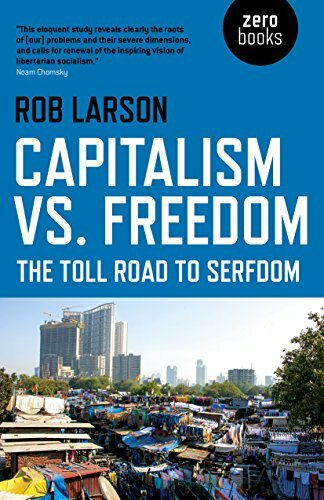 Capitalism vs. Freedom; The Toll Road to Serfdom (2018) | Moral Markets? A single-handed debunking of libertarian economics and "the age of Friedman"
For years, we’ve been taught that capitalism is good for freedom. Dominant right-wing talk radio hosts to this day recommend “libertarian” classics like Hayek’s Road to Serfdom and Friedman’s Capitalism and Freedom (1962) that claim markets free us, and this picture still dominates the schools and the political spectrum. Well get bent, one percent, because Rob Larson’s Capitalism vs. Freedom: The Toll Road to Serfdom puts big business under a microscope. 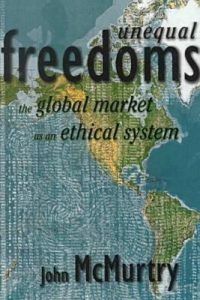 This book debunks the conservative classics while demonstrating that the marketplace has its own great centers of power, which the libertarian tradition itself claims is a limit to freedom. In fact, Capitalism vs. Freedom illustrates how capitalism fails both this and other concepts of human liberty, not just failing to establish a right to a share of society’s production, but also leaving us subject to the great power plays of the one percent’s corporate property. 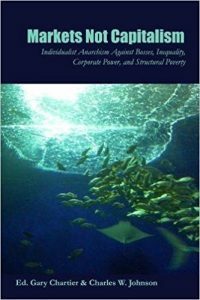 "In his new book Capitalism vs. Freedom, economist Rob Larson further develops a 'left' idea of freedom. But in doing so, he departs from the usual way of framing the 'positive-negative liberty' debate. Often, the left says something like “Free market economies may provide ‘negative’ liberty, but they do not provide ‘positive’ liberty.” Larson says that they do neither. In fact, he says, capitalism both restricts people’s ability to act and acts upon them against their will. [...] Those who believe capitalism doesn’t subject us to the whims of the powerful, Larson says, have not taken a look around them. In fact, concentrated economic power is so great that it acts as a kind of private government. It’s quite simple: Because money confers social power, where there is great wealth inequality, there is great inequality of power. 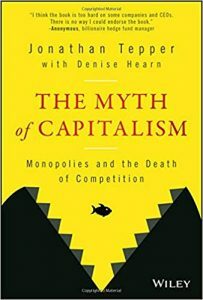 And where there is inequality of power, people aren’t free [...] Ironically, the concentration of capital means that one of the great fears about socialism—that decisions about what to sell would be made by small, unelected groups of bureaucrats, rather than determined by competition—is increasingly coming true under capitalism. [...] Larson takes us on a tour of the contemporary neoliberal nightmare, showing the various ways in which the poor remain disempowered and unfree while the wealthy live the 'freest' lives in human history. [...] Larson is a gifted economic writer who shuns jargon and explains concepts clearly and compellingly. Capitalism vs. Freedom is a useful book for introducing people to left theories of freedom, and it uses ample doses of humor to avoid leaving readers weary and depressed. The book collects lots of fascinating quotes and sources I had never read before, and Larson engages with the written work of free market theorists, presenting their arguments fairly and compellingly before flogging them mercilessly. Capitalism vs. Freedom helps us understand not only how power works in the real world, but how we might build a fairer society in which people had more meaningful control over their lives and workplaces. In other words: how we could finally be free." "the book’s lucidity and brevity should win for it a wide readership. In five chapters, Larson systematically demolishes the glib nostrums of Milton Friedman and Friedrich Hayek (in the process also dispatching those other patron saints of the right wing, Ludwig von Mises, Ayn Rand, and Murray Rothbard). [...] something that Larson doesn’t really focus on: within corporations, freedom, even negative freedom, is severely curtailed. [...] Capitalism in fact is a kind of fragmented totalitarianism, as privately totalitarian corporate entities proliferate all over society and constitute its essential infrastructure, its foundation. [...] Larson might have gone further in this line of argument by emphasizing just how much capitalists hate market discipline - i.e., the 'free market' - and are constantly trying to overcome it. They’re obsessed with controlling markets, whether through massive advertising campaigns, destruction or absorption of their competitors, price-fixing and other forms of collusion, or the formation of hundreds of trade associations. [...] Larson, unlike the charlatans whose work he reviews, actually does believe that 'concentrated power is opposed to human freedom,' so he dedicates his final chapter to briefly expositing a genuinely libertarian vision, that of socialism." Rob Larson is a professor of economics at Tacoma Community College in Washington State and the author of Bleakonomics. He's written broadly, including for In These Times, Dollars & Sense and Jacobin, and appeared on Alternative Radio and other programs.